This Website Is No Longer Active. 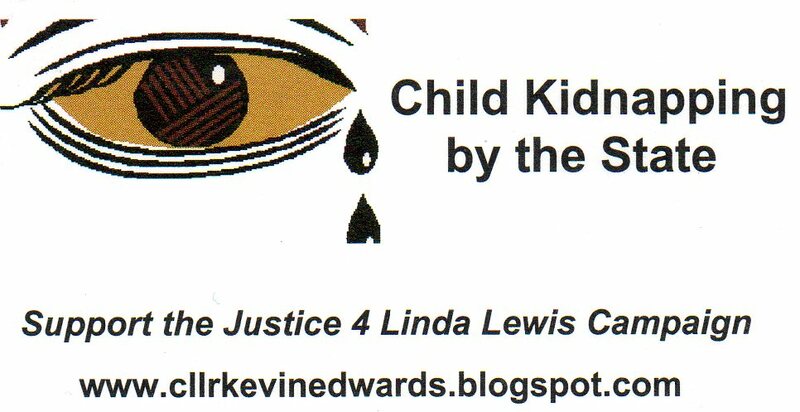 : " Its a Slam Dunk " say the American Activists of the " Justice 4 Linda Lewis Campaign." 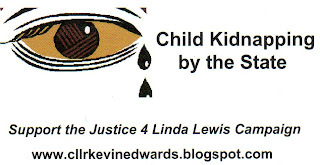 " Its a Slam Dunk " say the American Activists of the " Justice 4 Linda Lewis Campaign." Over 3000 people are actively involved in this case working tirelessly behind the scenes worldwide. All the evidence pertaining to this crime has been carefully placed onto over 300 discs safely held by trusted colleagues in over 30 countries. Taking on Bent Judges,Corrupt Politicians, Crooked Police Officers, Immoral and Dishonest Social Workers and Doctors, all who band together and hide behind a web of lies and illegal injunctions that they have concocted to save their own worthless necks was never going to be easy. Don't get me wrong it is definitely not all " doom and gloom. " Small breakthroughs are happening all the time. The Guilty are rattled and they should be even more rattled now than they ever have been before. Activists in America have made a big breakthrough. Why the American interest ? Well Linda's daughter then aged 12 in 1998 was kidnapped at gunpoint from her hospital bed in Florida by agents of Neath Port Talbot Social Services and returned to the UK on a false passport to cover up for medical negligence in the UK. An independent broadcasting station has agreed to study the evidence in full that could well lead to a documentary being made next year. So what tipped the balance ? A fraudulent and perjured letter that was submitted by a Mr David Johnston formerly the Social Services Inspector for the Welsh Office. See the original letter below. 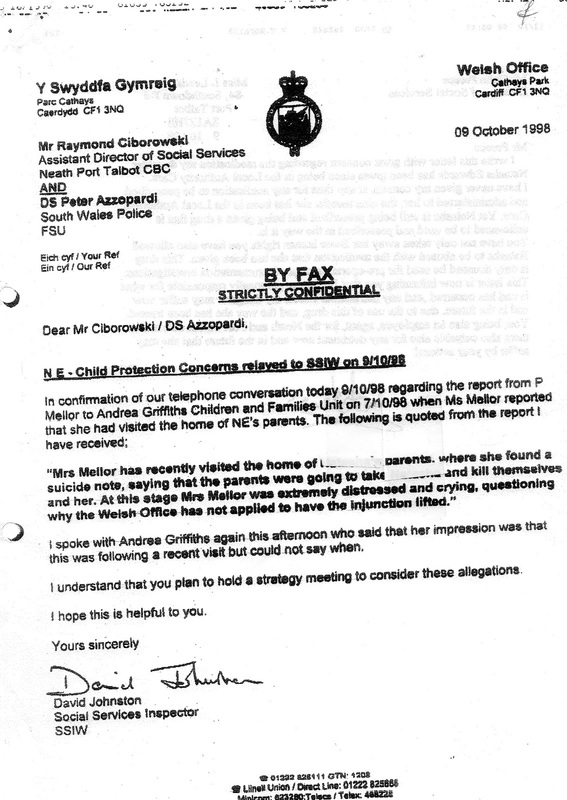 In the letter David Johnston clearly states that Miss Penny Mellor had seen a suicide note that the parents were going to "take the child, kill her and themselves." Obviously no such note ever existed ! This letter was submitted into an unlawful meeting in that Miss Lewis should have been in attendance under Family Court Law. She wasn't there. She knew nothing about this meeting and neither did Penny Mellor. So what did Penny Mellor have to say when she found out about David Johnston's letter ? See below. This is absolute proof that the former Social Services Inspector for the Welsh Office Mr David Johnston did enter a totally fabricated letter in order to pervert the course of justice and wrongly influence future court proceedings. I received the following email from Penny Mellor. Further proof that a serious crime has been committed here by David Johnston. So why has this American broadcasting station taken such an interest in the " Justice 4 Linda Lewis Campaign ? " Well according to my American friend it is because of the following article. Carwyn Jones the First Minister of the Welsh Assembly has been advised of this crime and has refused to even reply to my email. So now the Americans know that this is a cover up and that something very,very wrong is still being allowed to continue by those in authority who are still abusing their power and the trust of the people who they are duty bound to serve. He never told me until 7 years ago after spending almost 20 years in and out prisons. Several of his friends committed suicide shortly after they had their compensation payouts, most of them would not even give evidence, including my Brother and a friend of mine. Good news - lets see if it happens. The freeview russian news RT might be worth a try, they have featured UK social work cases in the past. Putin & Co are probably fed up with the sanctimonious lecturing on human rights in russia by the likes of jack straw. After all this case looks like one of extraordinary rendition with the pretence of a free trial, the family represented by someone who speaks nehind the back of litigants with those who can influence the outcomes. - Lyn Naylor? Still waiting for the evidence to come out on her. The reason most social services departments in Wales are such a shambles is because of the p"ss pot of a supervisory body the SSIW is. It can't even sort out the deadly SS in Swansea and the people Glenys Thomas [WAG minister ex NPT]]brought in to sort it out were insiders - a family court judge and a former head of NPT ss. Nepotistic and incestuous and in the meantime children or their childhood perish. Hey guys, May be the U.S. far greater off sticking with Syria's Assad?